We love La Rosiere but have often felt it would benefit from having even more cool stuff around the pistes. This year La Rosiere’s new larger ski area is going one further and adding a new attraction, a great big Igloo! The igloo will boast a surprising range of facilities with a bar but also a restaurant and a conference facility to host over 300 people! You can book it for a party or special occasion, reserve a table for a fondue or just stop by for a drink (bar is open 10AM – 5PM). They take 21 days and over 7000 cubic meters of snow to construct and carve the igloo structure. The igloo maintains an internal temperature of about 2°C which feels just right in your ski gear. It’ll last all season without much maintenance the altitude of La Rosiere plus the sheer amount of ice and snow means it won’t be melting any time soon. The igloo can be found down a path from the main Plan du Repos Express ski lift in La Rosiere. Find out more about visiting or booking an Igloo in La Rosiere. We look forward to checking it out on our next visit to La Rosiere and will be posting our pics to Facebook. Want to know more about La Rosiere? 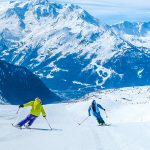 La Rosiere is a sunny and friendly resort with much to offer including pistes that cross the border into Italy. You can find out more about La Rosiere with these articles.